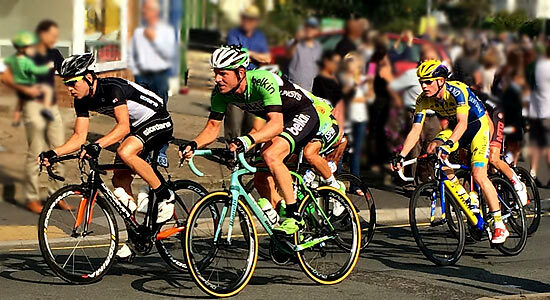 The Tour of Britain cycling race came through Malvern today, which was an amazing sight to behold. It was a case of ‘blink and you’ll miss it’ such was the speed at which the cyclists came through Malvern Link, where I was waiting with the crowds to cheer them on. Apologies to everyone for my mediocre photography – speed was not the only challenge; I also managed to pick the wrong side of the road to stand on! We often say here at Malvern that our instruments are used in so many application areas, that pretty much any subject you touch upon from day to day life, there will be a link. It turns out that cycling is no exception. If you brave the traffic to take your daily commute by bike, you may be worried about engine fumes. Our Spraytec spray particle and spray droplet size analyzer has been used to research fuel injector systems which could make vehicles more efficient while also reducing emissions. Malvern Instruments also contributes to a better cycle ride through the very material the road surface is made from. Malvern’s DSR rheometer is designed specifically for Asphalt binder (bitumen) testing and is the industry benchmark to make sure it’s up to standard, ensuring that roads are of a good quality and are durable – less cracks and bumps to throw you over your handlebars. Laser diffraction is also used to monitor the emulsions used in the Asphalt Industry – you can find out how in our recorded webinar. The rubber in your bicycle tires could also have been analysed with a Malvern instrument at some stage in their development. Our instruments are used to test rheological properties, polymer composition, latex particle size and zeta potential of rubber. And if you prefer an electric bike, enjoying the wind in your hair with little less effort, you’ll be pleased to hear that the Mastersizer particle size analyzer can been used by manufacturers to improve battery design, keeping you cycling for longer. I’d recommend you go and watch the Tour of Britain if it comes near to a town or city near you. I couldn’t help but get caught up in the atmosphere in the crowd here in Malvern. And as you’re waiting for the cyclists to whizz past, have a think about all the research and testing that goes into producing the materials around you.